Organic Pocket Coil Mattresses vs. Organic Latex Mattresses : Which is Better? Home > Blog > Organic Pocket Coil Mattresses vs. Organic Latex Mattresses : Which is Better? Organic pocket coil mattresses have become much more popular recently. For years, organic latex mattresses have dominated the market. Now, you have an additional organic option with a pocket coil mattress: both have some advantages and disadvantages including cost, customization options, and mattress support. 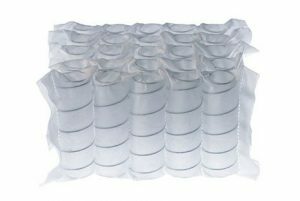 But first, if you aren’t familiar with the construction of a pocket coil mattress or a latex mattress, let me give you a brief description. An organic pocket coil mattress is made with a base of individually pocketed support coils. Pocket coils are metal springs that are individually wrapped in, and connected by, fabric. This is different than a traditional spring mattress, where all the springs are tied together with steel wire. In a traditional spring mattress, when one person lays on the mattress, the other side of the mattress moves as well. 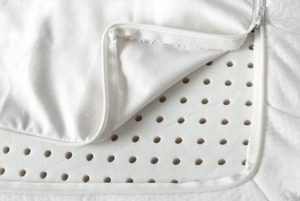 With a pocket coil mattress, since the springs are not connected but instead held together with fabric, it allows for less motion transfer between partners as well as more accurate support and pressure relief for your body. As one body part sinks it, the coils compress in that specific location. The base of pocket coils are often covered with a layer of natural latex (also called an organic hybrid mattress), and then the entire mattress is covered with an organic cotton and wool mattress encasement. An organic latex mattress is made with either a single layer or, more often, multiple layers of natural latex that can be customized to a specific firmness level. The natural latex layer or layers are then covered with an organic cotton and wool mattress encasement. An all-latex mattress is also excellent for dampening motion transfer between partners. One advantage of an organic pocket coil mattress is the cost. Generally, they are more economical than an all organic latex mattress. For someone who is looking to get into an organic mattress but wants to keep the price closer to a non-organic mattress, a pocket coil might be the way to go. See, for example, our Freefrom Pocket Coil Mattress, which is an excellent pocket coil mattress at a fantastic price point. One advantage of most organic latex mattresses are the customization options. Many of the organic latex mattresses come with different layers of latex, which can be customized to different firmness levels, like “soft”, “medium” and “firm”. For example, if you have a mattress with three layers of 3” latex, and each of those three layers can be customized as “soft”, “medium” and “firm,” and you can customize each side as well, you have quite a few firmness options! An example of this is the Bella Sera Nove 3 Organic Mattress. Pocket coils differ in the amount of customization possible, but they generally have less options than natural latex mattresses. For example, with the hybrid OMI Rossa Pocket Coil Mattress, the pocket coil unit comes in one firmness level, and you can choose the firmness level of the layer of natural latex on top (extra soft, soft, or medium). This amount of customization is plenty for most people, but if you are looking to fine tune the feel of your mattress, a natural latex mattress that offers more customization options may be a better fit. Another difference between an organic pocket coil mattress and an organic latex mattress is the feel of sleeping on metal coils versus sleeping on all latex. If you are used to sleeping on a spring or coil mattress, and you like it, an organic pocket coil might be a good match for you. If you are used to sleeping on a foam or memory foam mattress, and like it, an organic latex mattress might be a good match for you. With a pocket coil mattress, the support has more of a defined feel. You can feel the coils pressing against you as you lay down, which may feel familiar if you are used to a spring mattress. With an organic latex mattress, the support is more subtle; it initially feels softer, you don’t feel metal springs pressing against you, so at first, you may think that you need firmer latex layers to provide proper support. However, latex provides excellent support even with softer layers. It just does not initially feel like it, since the support is more subtle without the push back of the metal coils. Note that on many of our latex mattresses, there is a comfort guarantee option. Almost all of our customers who choose to take advantage of a comfort guarantee end up choosing softer layers of latex, which tells us that latex can be more supportive in a softer configuration than you would expect. Regardless of which option you choose, the best thing about both options is that these are healthy mattresses, made without chemicals and flame retardants, that support your body well and help keep motion transfer between partners to a minimum.